All mothers enrolled on the Maternity & Infant Scheme are entitled to a state covered 2 week and 6 week check for their baby. This is carried out by their GP and it is a useful point for us to check in with new parents to see how they are adapting to life, as well as checking up on their newborn. We occasionally pick up things on examination that require further follow up either with ourselves or in the hospital and happily serious issues are rarely seen. Perhaps the commonest questions we get are in relation to the crying or upset/irritable infant and how to deal with it. There is no foolproof way to deal with a crying baby but here we will try to outline things that you can do as well as pointing out a few things that mean you should get your baby examined by a doctor. Often a child who has a tendency to cry will not do so until after the six to seven week mark, so an irritable infant may have been an angel in the time prior to their six check! What can I do to help sooth an upset baby? There is, of course, no one size fits all approach but there are a few things that you can do. Rocking a baby can help, as well as speaking to them in a soothing voice. Some babies love a warm bath (others do not!) and it is essential to ensure they are not hungry or thirsty. Some will settle on being breastfed or bottle-fed. Changing their nappies or their clothes can be helpful and ensuring they are warm in Winter and maybe wearing looser clothing in the Summer. Holding a baby close to you in a sling so that they are comforted may also help. Some babies like a dummy. If you are in a busy or chaotic environment moving somewhere quiet may help. This is a difficult question to answer and cannot be answered definitively here. The points below are of a general nature and this list is NOT exhaustive. You know your baby best and if you are ever worried about your baby or your instinct is that there is something not quite right then it is wise to seek medical assistance. Who is best to call? We are covered by the DDOC out of hours service outside of our regular clinic hours so if it is after 6pm or before 8am and you are worried about your baby then it is best not to wait until the clinic opens. You can get phone advice and if it is more appropriate to wait until the practice here is open then you will be advised to do so. All the doctors in our clinic work in DDOC and the standard of medical care there is very high. All doctors working there have their consultations audited randomly every month to ensure that the standard of care is high and mistakes are not made, so you can be sure the doctor who will see your child has all necessary qualifications and is experienced. If you are very worried about your child then you can go straight to the A&E department at any time of day or night and your child will be looked after. There is often a belief that if you arrive in an ambulance then you will be seen faster than if you arrive in your car or by taxi-this is not the case. All patients are triaged on arrival so that the most urgent cases are seen the quickest. Temple Street is the closest children’s hospital. Many thanks for reading. No article is a substitute for a review of your baby if you are worried they are unwell. Talking to friends, parents and relatives can help and sometimes getting someone to look after your baby to give you a break for an hour or two can be a huge help. Our clinic can be contacted on 01-8461335 or 01-8038881. 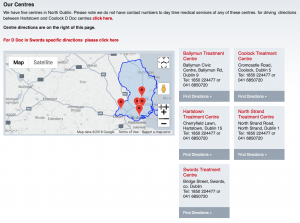 For non urgent appointment requests you can e-mail us on info@portmarnockgpclinic.ie. This article was prepared by Dr Niall.